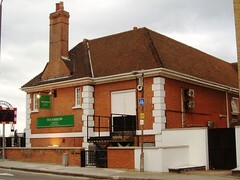 The Narrow (originally called the Barley Mow and then The Narrow Street Pub) was bought and renovated by Gordon Ramsay at the beginning of 2007. To quote the pub's website — "In its new form, Gordon Ramsay Holdings have created a warm and relaxed environment where the emphasis is on good quality food with real ales and ciders." There are a number of separate areas; a restaurant, a conservatory, a bar area, and a riverside patio. All except the restaurant are available to non-eaters and people who haven't booked. 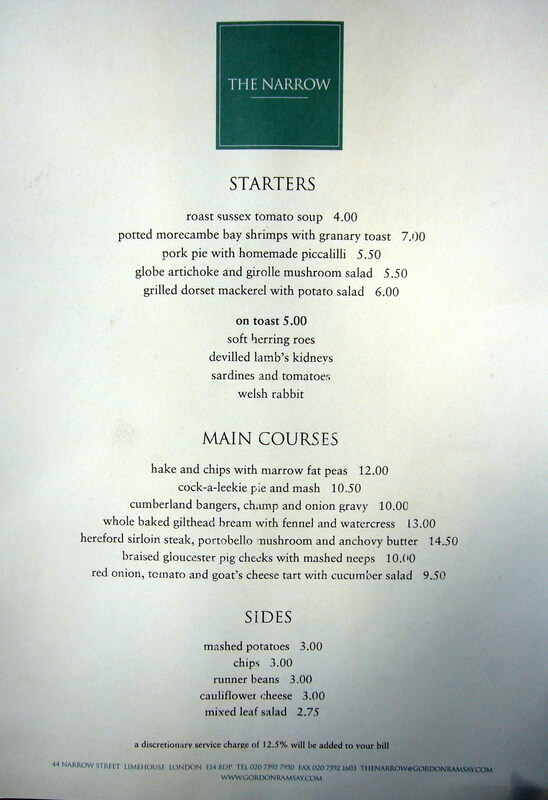 The restaurant serves traditional British food (pie, fish and chips, sausage and mash, braised lamb — posh versions, of course), while bar food (pints of prawns, pickled cockles/whelks/mussels, potted salt beef, dressed crab/lobster, ploughman's) is available in the other areas. Kake and Ewan visited on a Friday evening in June 2008. Arriving at 7pm, we were lucky to find a spare table. Two real ales were available: Adnams Regatta (£2.80/pint) and Deuchars IPA (£2.70). There was another handpump with no clip, which judging by other reviews on the interweb usually has Pride on. They also have some good lagers (including Meantime), and a very nice wine list (a large glass of pinot grigio, for example, is £6, and this is the mid-point of the list). We sat in the conservatory, which has a rather nice view over the river. It seems that despite the Gordon Ramsay connection, this place is actually a decent bet even if you just want a pint. Ewan returned for a meal on Sunday lunchtime in January 2009. Although not having booked, the staff were able to find him a corner table in the dining room, which they described as 'cramped' but wasn't so bad at all. The room is decorated with historical maps of the river and music plays, perhaps a touch too loudly. Service was swift enough, and friendly. Bread was placed on the table right away with some tasty butter, and our drinks orders were taken. Tap water did not come initially, but when we asked again, an iced jug was brought out. Most of the mains options were fish-based, but Ewan's wild mushroom tart was a very pleasant vegetarian option (£9.75), laid out on a bed of greens, with parmesan shaved over the top photo. Jo's mushrooms with watercress on toast (£5.50) didn't skimp on the mushrooms certainly, though the toast was rather small. For afters, a fantastic cheeseboard (£7.50) had a deliciously soft brie, some goats' cheese, a fine hard cheese and a creamy blue cheese, served with four crackers, some lovely quince chutney, and a stick of celery photo. The port which we asked for was also excellent, though they did bring us the more expensive one by default (there were two on the menu, at £5 and £6.50 a glass respectively). However, a fine meal: more expensive than you might expect at most pubs, but no less enjoyable for that. Last visited by Ewan and Jo, 25 January 2009. Opening hours taken from Time Out website, April 2008. Last edited 2013-05-10 07:37:26 (version 27; diff). List all versions. Page last edited 2013-05-10 07:37:26 (version 27).